The content of this article provides interesting facts and information about the History of Rome. For ease of access the History of Rome is divided into just the categories - the founding of Rome and the Kingdom of Rome, the Roman Republic and the Roman Empire. People, places and events are still listed in chronological order with the relevant dates where appropriate. History of Rome providing fast facts and interesting information about the founding of Rome. The section on the Ancient History of Italy details the early inhabitants of the country. According to legend Rome is said to have been founded by the twin brothers Romulus and Remus on the 21st of April, 753. The city of Rome was named after Romulus. The Kingdom of Rome is established by Romulus whose reign is followed by six other Etruscan Kings - this period is therefore often referred to as the Rule of the seven Kings of Rome. The Roman Senate was established as an advisory body to the Etruscan kings. The Kings were eventually replaced with a republic (a Republic is a country without a king or emperor - the people who rule a republic are elected). 534-509: Reign of Tarquinius Superbus (Tarquin the Proud, the last king of Rome) and War with the Volscians Foundation of the temple on the Capitoline Hill. History of Rome providing fast facts and interesting information about the Roman Republic. The Roman Republic was the ancient Roman state which started in 509 BC and lasted until Augustus assumed power in 27 BC. The Roman Republic was governed by an elected Senate. The 300 members of the Roman senate, all from aristocratic families, grew in power. The senators were appointed for life. The senators selected new senators to replace any who died. Senators also appointed two senators to become joint heads of state for a year. These heads of state were first known as praetors and later as consuls. Each had the power of veto on any action of the other and to avoid serious stalemates in a crisis the constitution of the republic provided for another more powerful office with the title of dictator. But a Dictator could only have power for a period not exceeding six months. The Plebeians (Plebs) protested at their total lack of power and exclusion form any benefits of the Republic. Their protests led to the creation of two powerful new officials called the tribunes of the people to safeguard plebeian rights. Dissatisfaction with the Senate led to civil wars and the ultimate decline of the Roman Republic. The decline of the Roman Republic culminated in a brief dictatorship by Julius Caesar and the fall of the Roman Republic and the rise of the Roman Empire. History of Rome providing fast facts and interesting information about the Roman Empire. The 500-year-old Roman Republic had been weakened by civil wars. Octavian the adoptive son of the dictator Julius Caesar is given the title 'Augustus' by the Roman Senate and becomes the first emperor of Rome - The Rise of the Roman Empire begins. 235 - 284 AD: The Crisis of the Third Century was the period in Roman history of Military Anarchy which lasted over 50 years. Not one single Emperor died of natural causes during this time. There were Revolts, civil wars, street fights, fierce foreign enemies, plagues, famines, fire and earthquakes. 238 - 268 AD: The "Barracks Emperors" were all military generals who seized power by force. Taxation was high, the economy was failing and Roman territories were being captured by barbarians and the Roman government was unstable. During this terrible period in Roman history there were 19 usurpers, or pretenders, to the throne but this period is usually known as that of the 'Thirty Tyrants'. During this uncertain era and violent environment people started to turn towards a new religion - Christianity. The content of this History of Rome category on life in Ancient Rome provides free educational details, facts and information for reference and research for schools, colleges and homework. 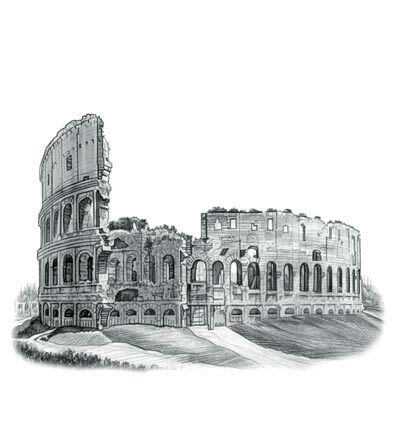 Refer to the Colosseum Sitemap for a comprehensive search on interesting different categories containing the history, facts and information about the History of Rome.